The onion seedlings have been transplanted out back and are doing good, but the lettuce is suffering. Some animal (or child?) is digging around in the pots, not eating the lettuce but uprooting it. I’m down to two plants. But, I direct-sowed some seeds in another container. I get too attached to each little plant. I need to just plant more types of seeds and lots of them, and expect a certain percentage of loss. Speaking of seeds, I got a surprise in the mail the other day: sugar pumpkin seeds from my friend F., from her family’s farm! It was spooky timing because earlier that day, I had been thinking how bummed I’ll be if I don’t get pumpkins this year. I bet these seeds are going to be the charm. Thank you F.!! Sunday was an especially nice day: just me and my daughter out in the yard early in the morning, me with my coffee and the wheelbarrow full of mulch, and her planting (in her own special way) the flower seeds she picked out a while ago. We also went to my older son’s flag football game and the playground, so we had lots of outside time. Monday, for the first time in forever, I did “real” food shopping, at Wegmans, instead of online ordering at ShopRite. It was fun to pick out food myself, see new products, and buy some random things. My daughter was an angel, probably because she had one of the racing car-type carts. But I spent $187 and still somehow forgot a ton of stuff, so I have to go back out today. At least I got my four gallons of milk for cheap — Wegmans has the cheapest milk, by far. 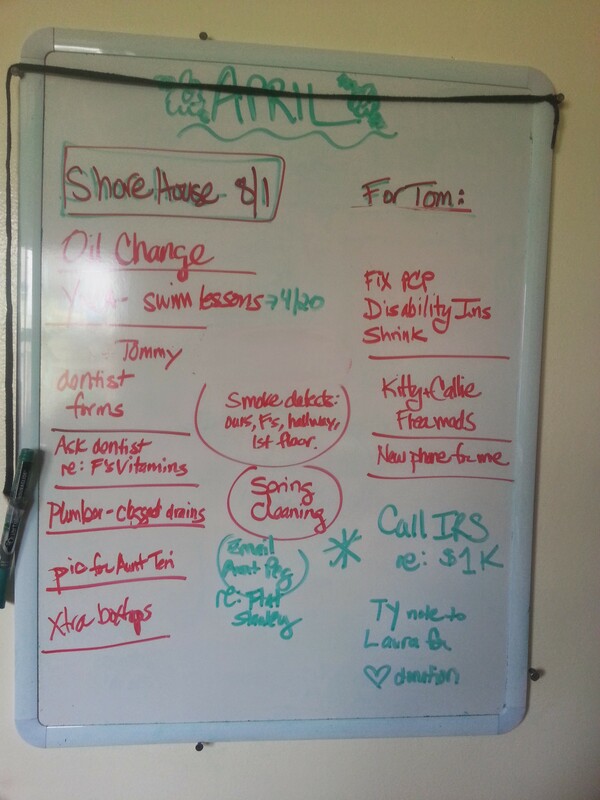 And also rewriting my white board, which is where I keep my running to-do list. Tuesday it rained, so I did all the non-outdoorsy stuff: paperwork, phone calls, computer stuff, bills, budget, making appointments. Dinner = rotisserie chicken and bagged arugula salad (Wegmans impulse buys) and homemade mashed potatoes. Yesterday, Wednesday, was another good-weather day, but I had agreed to volunteer at my older son’s school, in the library, and then when I got home I decided to make it Ambitious Dinner Wednesday. 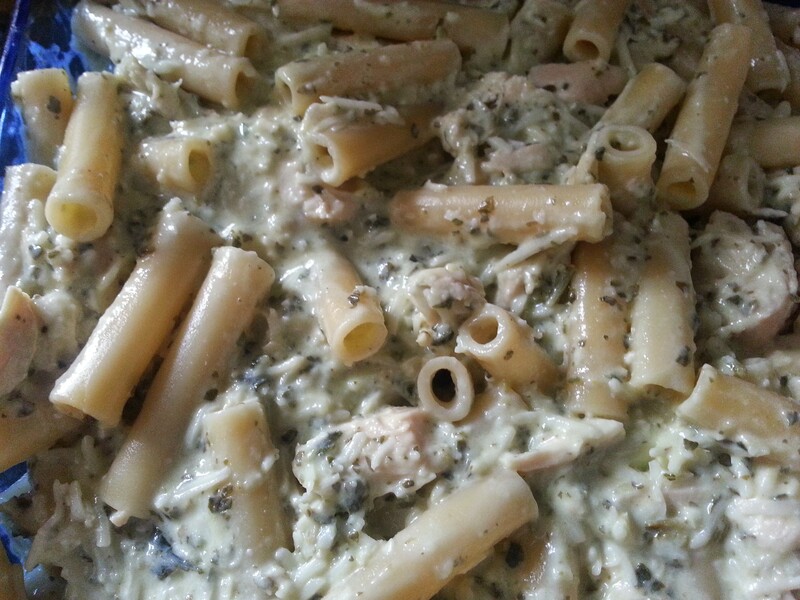 I spent a lot of the afternoon prepping this Chicken Pesto Casserole: making Alfredo sauce and baking a chicken breast. I also made polenta so it could chill in the fridge, in hopes of frying it later. I love polenta! Nobody else does, but the hell with ’em. Closer to dinnertime I put it all together. When the casserole was baking, my younger son said, “What is that smell? I love that smell!” Alas, he did not like the taste of the casserole. But my husband, my daughter, and I loved it. 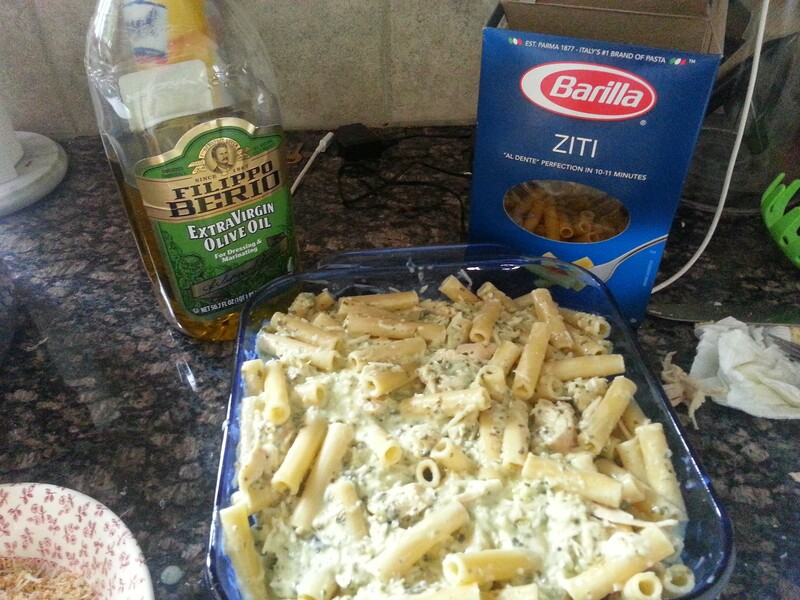 My oldest couldn’t eat it because the pesto has pine nuts (not that he would have). So that was a success, I guess. The polenta, however, fell apart in the frying pan. I need to find a new recipe or set of instructions, because this is like the third time this recipe has failed me, so I don’t think it’s me. After dinner, though, I went back and fried just two pieces (instead of trying to do a whole batch) and it came out OK, good enough for me to shave some Parmesan on it, add some salt, and wolf it down. Yum. Wondering if I could come up with a frugal alternative to buying curtain rods for my family room and my daughter’s room. They don’t tend to show up at the thrift store or Goodwill, I don’t think. I swear I saw, on the Nonconsumer Advocate Facebook page, someone using branches as curtain rods. I guess they had some woodworking skills?? I’ll have to try to find that thread. Speaking of that page, a couple posters there have mentioned the shopgoodwill.com site. Basically, the Goodwills across the country run an eBay-like site where you can bid on items. I finally checked it out the other day, and it’s definitely a good site to keep in mind when you are looking for specific items. It’s another nice day today, so I need to get off the computer and get out there. We have critters digging up all of my plants too and actually had a guy set 2 traps today, one for a ground hog and one for a skunk. I feel bad but they are destroying everything and we really don’t want them in the veggies. 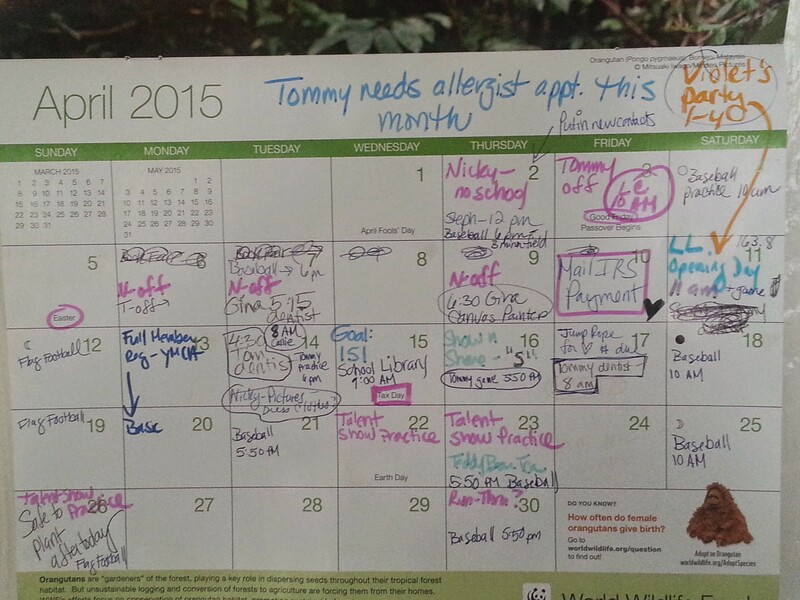 Your calendar is crazy packed I don’t know how you do it all! I can’t wait to see the headboard, I bet it will look great sorry it’s such a pain though! The headboard is coming along — I spray painted primer on it today and it looks neat. Now I’m excited about it again.